3PP is delighted to introduce one of art history's true online pioneers. Alexandra Korey is an art history professor turned blogger. Her wonderful story encapsulates the amazing potential of the web to reach a global audience, as well as highlight some of the traditional stigmas attached to art history professionals having an online presence. It takes a person with great individual drive to achieve what she has, and I was hoping to get a glimpse of this when I invited her to 3PP. What I discovered was more than just a driven individual, but someone whose work and personal history with the study of art are passionately intertwined. Alexandra is an inspirational example of someone living their passion, and staking their professional reputation on their work. To this, one can only say Brava! On behalf of art fans and art history professionals discovering the wonders of the web, I would like to thank Alexandra Korey for all her efforts. Her amazing work is an inspiration to all those involved in promoting art history in an online context. Keep up the great work Alexandra! 3PP: Can you describe the different sites you run, and their respective aims? 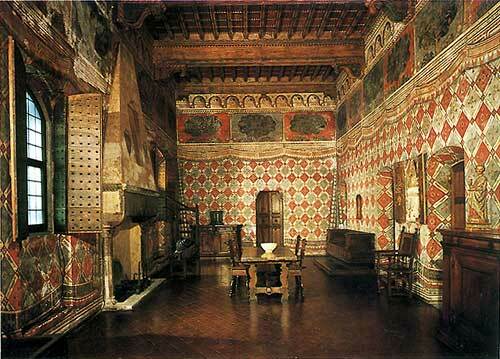 AK: The two main blogs that I work on are Arttrav and Tuscany Arts. Arttrav.com is my personal blog that began in 2004 when, on a trip to Rome, I didn’t find what I was looking for in a guidebook. From there, it grew to include Florence, and over the years it has morphed, and will continue to morph, based on my interests. Right now I’m blogging more about expat life, for example. 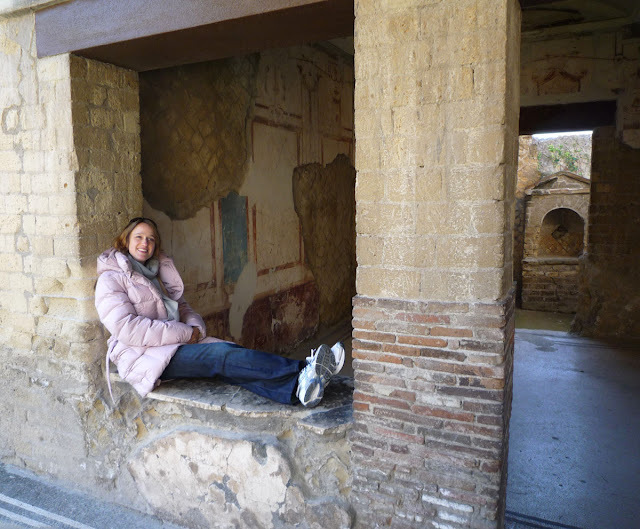 edit: Since 2011, Alexandra no longer blogs at Tuscany Arts, but can still be found blogging at Arttrav, as well as writing for The Florentine. 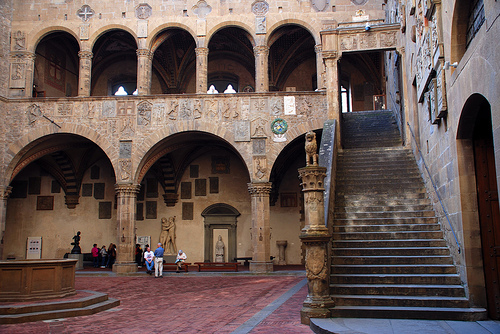 Tuscany Arts is the official blog for the arts of the Regione Toscana; it’s part of a rather experimental and forward-thinking project to encourage tourism through social media. The goal of this blog is to communicate the wide range of cultural attractions in Tuscany to a traveller interested in getting a bit off the beaten track. 3PP: What does art history mean to you? AK: This is a very hard question. The “school” of art history to which I have always subscribed is “social art history”, but I don’t only depend on the traditional sources of the social school; I like to also include materials more traditionally used in intellectual history. For me, “art history” means explaining the visual in relation to how it was used or understood by the society in which it was created, and I’ll use any information I can get my hands on. I realize that not much of this shows through on my blog(s), and there are good reasons for this. A proper social art-historical study of any work of art can take from 10 pages to a whole book or lifetime of work to explain. When travelling I think we can get a better sense of a culture and that helps me in my mission of understanding the visual in relation to its production, but in the end you gotta' hit the archives and the books to complete it! 3PP: You've mentioned your fascination with art history being related to travelling with your parents when you were young. Does this explain your interest in writing about art history from a travel perspective? AK: You know, I hadn’t thought of that! But now that you mention it, that could be one explanation. For me, it was seeing works in situ while travelling and then studying abroad that really kindled my interest in art history. When you go to Rheins Cathedral, you can actually imagine the Kings of France for centuries being crowned there or think about what it might have been like to a peasant to witness all this grandeur. When you enter Palazzo Medici Riccardi in Florence you can put yourself in the shoes of the ruling family, living in those interconnected rooms. I guess by writing about “art and travel” together I hope others can benefit from this type of experience. 3PP: You've related that you did not reveal your name or qualifications when you first started blogging. Do you believe there is a stigma attached to a professional art historian blogging? Has this changed over the years? AK: Yes. There is a stigma attached to being a “professional” art historian (i.e. professor) and being a blogger. I don’t think there is really room for it in most academics’ minds, not to mention in their schedules. All the professors I know have too much to do and their creative energy has to go towards producing material valid in the train track to tenure. If you’re blogging, this can be perceived as not serious, not working, not having anything better or more high-level to do. (Consider that even electronic publications or creating an online database of images and documents does not count towards tenure.) The same goes for being on facebook, which is seen as a waste of time. To this I say: I’ve had some interesting conversations on facebook and read some very high level blogs. It’s not the same as reading the journal of ethnoanthropology, but thank god! We need variety in our lives. Is this changing or has this changed over the years? I don’t know for sure. Universities and those who work in them are realizing the need to jump into social networks in order to preserve and promote their images, and in this acknowledgement of the power of digital there may be space for blogs, too. 3PP: Initially as a study abroad student, and now a resident in Italy for over 10 years, has your view of art history adapted to incorporate local perceptions, or do you still feel like an external observer? AK: I think one’s education in these things pretty much decides one’s approach. I did all my art history studies in Canada and the USA and I have never had much exposure to “the Italian way” other than through reading and hearing conferences by Italian scholars. I think the anglo-saxon method of communication and study is very different than the Italian. I am totally Italian in a lot of everyday things (like in having adopted the country’s general fear of having a cold neck, resulting in a permanent wearing of a scarf) but my art historical method is 100% americano. 3PP: You are one of the very few professional art bloggers not attached to a newspaper or museum affiliated site. Can you briefly describe how you came to be a professional art blogger? AK: I got this job pretty much by chance – the people who developed this campaign for the Regione Toscana knew my blog and knew me through social networking groups. But opportunities are growing for “content producers” like me as many types of companies in the arts are starting blogs. There is nothing wrong with corporate blogging if it’s in a field in which you can be sincerely interested! 3PP: You spent some time in teaching. Are you still actively involved in formal teaching, or is your blogging a full time job? AK: Right now I’m blogging full time – and doing other activities related to the social-media promotion of the arts in Tuscany. This job doesn’t make way for a teaching schedule. But this doesn’t mean that I won’t teach again in the future. I hope to. In the meantime I do a fair amount of public speaking and guest lectures for communications courses as well as for occasional art history courses. I see teaching and blogging as very compatible activities – the goals of diffusing information and instructing are present in both (or at least it is that way for me). 3PP: Your sites integrate with social media platforms like facebook and twitter. What are the advantages of these platforms to promoting art discussion? AK: Sadly, there is not a whole lot of art discussion on facebook, twitter, or other social media. The rules of engagement in these spaces simply doesn’t favour long-windedness. The advantage to being in these places is another: the general promotion of the blog in question. Facebook is one of the principle drivers of traffic on the internet. I’m interested in knowing what our readers think is the best way to engage them in conversation about art, either on a blog or on facebook. I wish I had the answer! Alexandra's sites also includes professionally presented videos and photo slideshows. This clip on the Bronzino exhibition at the Palazzo Strozzi is a wonderful example of her informative style. 3PP: The presentation and language of your sites makes art history knowledge accessible to the general public, rather than an esoteric academic audience alone. Is this the key to making art history have a stronger presence on the web? AK: I don’t know. Does art history need to have a stronger presence online? Are there things that are better left to books? I think the internet as a medium has the potential to move people, to entertain, and to provide information at the same time. Reading online is, for the most part, a conscious choice on the part of a person who could be spending that time doing something else. This is one of the pleasures of blogging because I know that people actually choose to read my posts, while students in a classroom don’t always want to be attending (sadly). At the same time, it’s a challenge: how can I make something appealing enough for people to stick with me, to read to the end, maybe to read something else on the blog too? I subscribe to a bumper sticker I once saw: eschew obfuscation. The Italian expression is “parli come mangi” – talk like you eat. I favour simplicity. I think that works in the classroom and online. At the same time, I don’t think that academics really need to talk to each other online; they can do that at conferences, in university departments, through publications. So yes, I don’t “dumb it down” for people but I don’t want to exclude anyone, so I just write in the simple way that I think. While I may know a technical or Latin word for something, I leave it out unless there is no common way to say it. 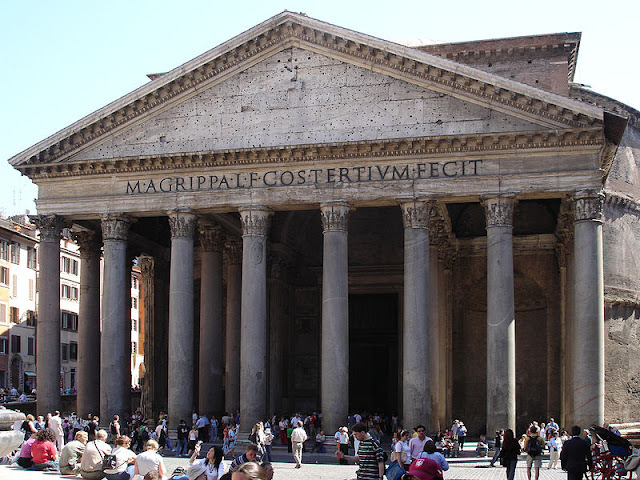 To be honest, half the time I forget the fancier way to say things (like all those parts of Greek architecture) so I figure other people have the same problem ;-). 3PP: I often get a sense that you hold back a lot when you write your pieces, tailoring the content to a particular audience. We all know you have a tremendously deep and fascinating knowledge, how can we encourage you to show more of this in your writing? AK: I think this question is very nice encouragement. But I’m not sure I know all that much! i) I think the university classroom is the right place to bore people to death, while I personally want to be at least moderately entertained by what I read online. My attention span online is pretty short so I write for people like me. ii) I blog also for myself, in my spare time. One only has so much brain power in a given day. 3PP: What advice do you have for amateur bloggers like myself, or students thinking about blogging about their art history experiences? AK: For those considering taking up art history blogging, go for it! In a general sense, and this goes for starting any website, take some time to think about your goals, your specific topic, niche, or interest, and your potential audience (or if you prefer not to have one – you can have a private blog). *Blogging forces you to act: I think that writing a blog forces us to do, read, and think more. I’m always on the lookout for “content”. *Blogging is conversation: I’ve always thought that talking in front of a work of art is the most productive form of looking and in an ideal world that conversation continues online, as it does often here on 3PP. *Blogging is teaching and thus helping: For me, getting things out online also means that I consider what I see already from the point of view of communicating it to a reader – what do they need to know, and in what order – and that’s really a lot like teaching. As for advice for amateur bloggers, don’t look at me – learn from Hasan! Never before have I witnessed such fast growth in a blog, and it’s all due to his generous cultivation of personal relations with his audience, the most active of which also write about art history. 3PP: Can you describe a special experience at a gallery or museum? AK: I’ve said this elsewhere and I’ll say it again: enough years of grad school and they’ll train any “experiential viewing” out of you. I probably had LOTS “special experiences” in museums when I was a kid, but even from a young age I always wanted to learn about art and share it with others. I travelled with my mom as a pre-teen and she says I used to tell her about the works of art. I have no idea what I told her or from where I got that information but apparently I learned it at school (I was very lucky to have art history as a separate subject in my high school). A friend of mine told me last weekend that he likes my “new role as a diffuser of information” and I think that’s a great definition. While this role conditions in part my own viewing experience, I think it’s a reasonable price to pay. I am not someone who reacts very emotively to most of the art I see. On the other hand, the visual plays a big role in my emotions. This year while blogging for Tuscany I rediscovered the land around me. Some of the greatest moments this year have been my pure enjoyment of the beauty of the landscape, a combination of natural and man-made that beats any Renaissance painting. Alexandra is indeed a natural 'diffuser of information.' 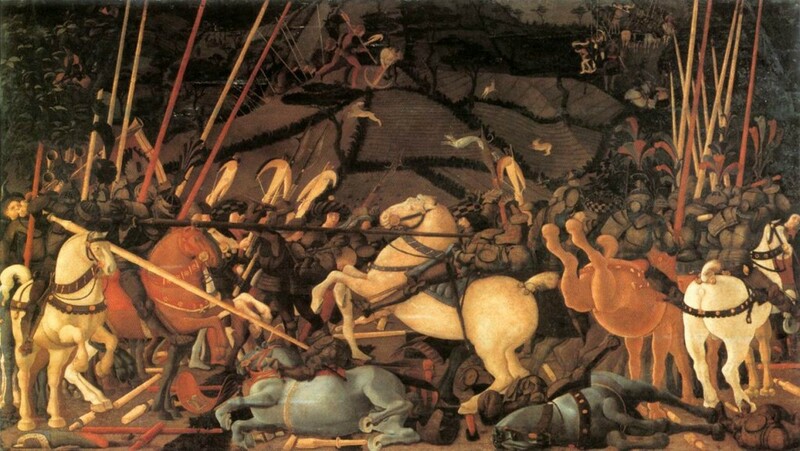 Using Uccello's Battle of San Romano as an example, her post How to look at art is a wonderful introduction to making the most of viewing artworks in situ. You really did manage to sneak that phrase of flattery in, eh? Really I don't consider myself a pioneer of anything; I don't think i thought of myself as an "art history blogger" until you told me that's what I was - I am an art historian, who just happens to blog! Here's to the future of what we do, whatever it's called. Cheers! and thanks. What a great interview! It's fun to learn more of Alexandra's work and thought processes. I think really like how Alexandra discussed that blogging is a form of teaching. I feel that way as well, and I think that's one of the reasons why I initially was attracted to the blogging medium. Plus, I often realize that I teach myself in the blogging process! Aside from myself, though, it's always nice to feel like I'm sharing information with other people. Alexandra brought up a great point about people who read blogs want to read them, whereas not everyone in an art history class wants to be there (sadly). It's nice to know that blog followers are sincerely interested in the topic at hand. @M thanks ;-). I learn too, in the blogging process, but perhaps more often than not I only grab the necessary material to digest and transmit it. Is that really all that different from when we're rushing to prep course material, no, but I miss the leisurely approach of... wait, did I ever have that luxury? Cheers Alexandra and M :) I must admit, one of the greatest bonuses for me in doing this stuff is learning. Reading posts at other blogs and processing other resource info to present here is a great impetus to verify facts and see what else is out there! I have had quite a lot of queries about the identities of the numeral ladies. I indeed did pick them to represent pioneering women in art history, just like Alexandra. Since Alexandra is an acknowledged expert on Artemisia Gentileschi, that was picked as no.1, the rest are in no particular order. All images are believed to be portraits of the artist, except 10, which is possibly a portrait of the artist. 11. Judith Leyster(1609-1660) >> I love this portrait! For those after a great resource on female artists, the CLARA database at the NMWA(National Museum of Women in the Arts)is a good place to start. A very nice and informative interview. I especially appreciated Alexandra's honesty in discussing the reluctance of traditional art historians to enter the online world. So much research goes unknown because of the very limited publishing opportunities available. I think many young scholars are afraid to put their work on the web because they fear it will ruin their careers. As someone with a medical/science background, I think I am spoilt by our relative eagerness to engage on the web! A vital part of our everyday practise is being able to access the latest research online at places like the Cochrane Database and Medline etc. We justify funding costs for treatment programs via these resources - it strikes me as remarkably draconian that the art history academic community are not engaged in this manner! There must be change in the wind though, surely? With an increasing amount of art historians blogging, it is only a matter of time until universities wake up. A nice example of a forward thinking university in this regard is Mississippi State University - art historian Ben Harvey's blog Emanata is actually part of the MSU College of Art and Design Webspace. There are perhaps other university sponsored staff blogs out there, but Ben's is the only one I've found so far. Kudos to MSU for supporting their staff in this way! Loved the interview and certainly related to a lot of the issues Alexandra raised. Apart from mine, I don't know of any other Art History blogs "sponsored" by a department or college, but I'm assuming there must be others. I haven't done a concerted search, though. I'm assuming it's a lot more common with tenure track artists and graphic designers working in studio programs. If there's sufficient interest (and I can't see why there wouldn't be), I'm thinking of proposing a conference panel on the subject of the "art history blog"--perhaps at CAA 2012 (Los Angeles) or SECAC 2011 (Savannah, GA). I'd be curious to hash out some of these issues a bit more thoroughly. And then blog about it!!!! If anyone's interested in participating, let me know. HI Ben! If i can get even the remotest small grant to attend either conference, I'm totally game to join you! I see SECAC as more of a possiblity as I have friends in Athens who usually attend (and at whose home I could stay for a few days). I just let my CAA membership lapse but am willing to rekindle it... I think it's a fascinating idea to organize a panel on this topic. Let's work on it together?! you know where to find me right? an always good email is info at arttrav dot com. I do want to add that I've only ever received words of support from professors to whom I've revealed my blog(s), so maybe it's all in my head. There are plenty of cool profs out there who "get it" - even if they are too busy themselves to record their daily lives on a blog or on facebook. That sounds very intriguing Ben! It's about time someone thought about putting art history online on the discussion table. My only comment at this stage would be to extend the field of discussion to art history in an online context, which would of course include blogging. The work being done by SmartHistory and WGA(Web Gallery of Art) parallels the achievements of art historians and students joining the blogosphere. These combined perspectives can only help strengthen the case presented for the value of art history in an online context. I'm all for getting involved with discussions about on-line art history, whether at CAA (funding permitting) or via the blogosphere. Never been to SEAC. Great idea, Ben. (Thanks for pointing this conversation out to me, Hasan.) Ben, yours is the only art history blog (of which I am aware) that is sponsored by a university. I'd be very interested in going to or participating in an art history blog event. (I would prefer CAA, simply because I was already hoping to attend the conference. I also know of other bloggers (like Heather Jensen from Art History Salon who will probably attend CAA. Heather helped to co-chair a CAA session last year. I couldn't say if she would be interested in actively participating (she may want to have a break this year! ), but I imagine that she would be interested in the topic. I'm just sorting out a format where we can get all the interested parties in one (web)space to discuss and forward ideas (as opposed to a clunky group email). Heather was definitely on my list of people to keep in the loop, I love Art History Salon! I'm very pleased for you art historians!! It sounds like you are about to make an historic step forward, no matter how big or small that step may be - the fact that it is even being discussed is extremely signficant!